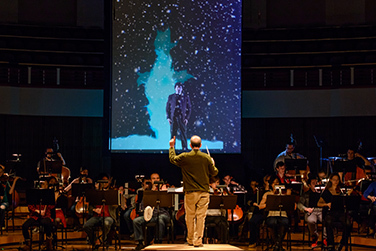 Drawing from various holiday stories seen through the eyes of children, the UMD Symphony Orchestra and UMD Chamber Singers provocatively combine excerpts from Tchaikovsky’s Nutcracker Ballet with David Lang’s poignant little match girl passion for solo chamber choir. The inter-weaving of these two works with imagery by video designer Tim McLoraine looks to find a common thread between the lives of those who may have and those who may not. The most unusual combination of holiday music goes to the University of Maryland Symphony Orchestra and Chamber Singers. The goal behind combining the two vastly different pieces was to show how people really feel during the holiday season, said Steven Seigart, who conducts the chamber singers during the performance. The performance, presented by this university’s School of Music, exemplified the definitive contrast between rich and poor, joy and sorrow and luxury and squalor with both the whimsical, billowing sounds of the orchestra and the delicate, chilling vocals of the choir.